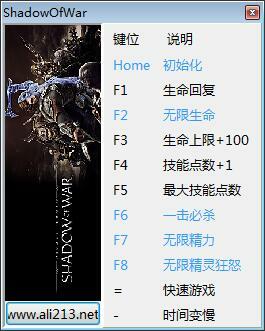 《中土世界：战争之影|Middle Earth: Shadow of War》修改器 v1.0 by:peizhaochen - 中土世界：战争之影 - 游侠NETSHOW论坛 - Powered by Discuz! 悼念菲菲 + 1 F4 技能点数+1 初始化后在角色界面按了没反. GMT+8, 2019-4-25 06:43 , Processed in 0.300095 second(s), Total 20, Slave 14 queries , Gzip On, Memcache On.